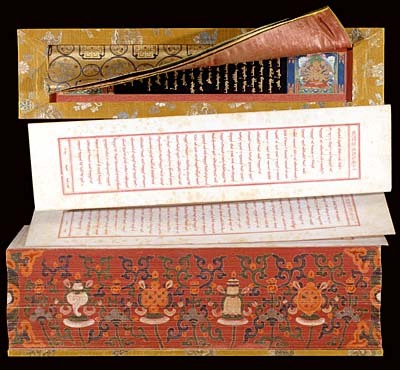 This work, the title page of which has a foliage decoration, contains the full edition in seven “sheaves” of a Mongol translation of the complete works of Nag-dban-blo-bzan-chos-Idan, first changkya khutukhtu (1642-1714), wood-block printed in red ink on paper in Beijing in 1727. Bibliographical information in Chinese, such as the “standard title”, sheaf number, continuous foliation and number of the work, feature in the right-hand margin of the frame. Each sheaf, wrapped in fabric, has two protective wooden boards covered in yellow-gold silk with multicoloured decorative motifs of dragons, flowers and clouds. The inside of each board forms a rectangular recessed frame, protected by 3 variously coloured double silk nets. Within the recess is glued a sheet on which appear, on either side of a text written in gold ink on a black ground, two “vignettes” representing deities. The borders are embellished with the eight propitious signs (bkra-shis rtags-brgyad) laid out in a stylized plant decoration on red ground.